I found this recipe several years ago and absolutely love it. I don’t make it very often because its not really that healthy, but my oh my its delicious! I think its the perfect summer time pasta– the fresh greens and balsamic vinegar just scream warm weather and dinner outside! This is also a great pasta for a picnic or a pot luck because its just as delicious at room temperature (perhaps even better). Season steak with salt, pepper, herbs de Provence, and minced garlic. In a skillet, heat 3 TBS olive oil over medium heat. Cook the steaks for about 7 minutes per side. Remove the meat to a cutting board and let rest while cooking pasta. Bring a large pot of salted water to a boil over high heat. Add the pasta and cook until tender but still firm to the bite, stirring occasionally, 8 to 10 minutes. Drain the pasta, reserving 1/4 c. of cooking water. In a small bowl, whisk together the balsamic vinegar , dijon mustard, 1/2 tsp. salt, 1/2 tsp. pepper, basil, parsley, and 3/4 cup olive oil. In a large bowl, toss the pasta with half the salad dressing and reserved pasta water. Set aside. 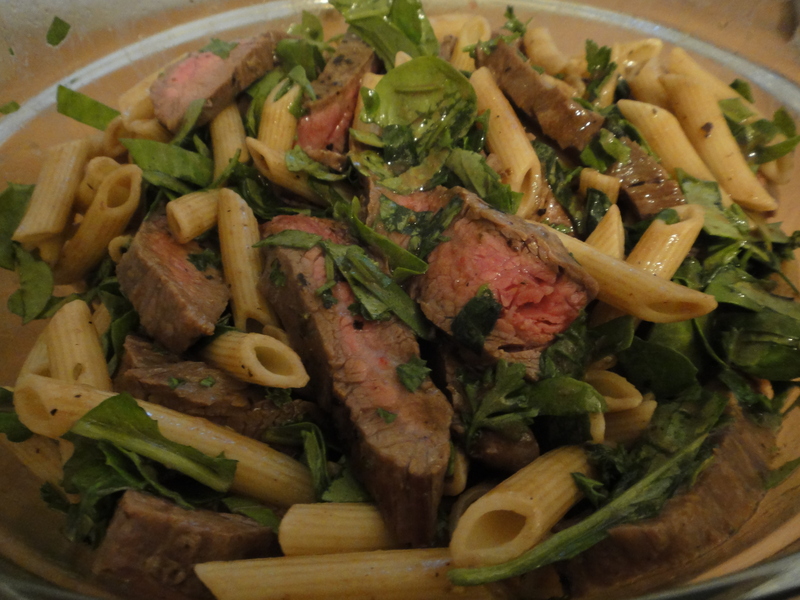 Slice the steaks thin and add the pasta with arugula. Add more dressing and season with salt and pepper as needed. Great idea and I’m always looking for more arugula recipes.